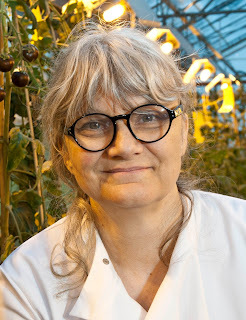 Science as a destiny: An interview with Cathie Martin - the genius behind super purple tomatoes! An interview with Cathie Martin - the genius behind super purple tomatoes! This week, our department had a very special visitor indeed –Professor Cathie Martin, plant biotechnologist extraordinaire and the genius behind the original ‘purple tomato’. Using genetic engineering, her lab was able to express genes from Snapdragon that regulate the production of anthocyanin compounds that give the flowers their purple pigmentation. Anthocyanins have been demonstrated to help combat cardiovascular disease, but it can be difficult to obtain enough from diet alone. Since then, Cathie has gone on to develop other tomatoes, including one with the equivalent amount of the ‘miracle compound’ resveratrol as 50 bottles of red wine! With an MBE to services for plant biotechnology, several patents and a spin-out company to her name (not to mention publications beyond count), I couldn’t resist grabbing her for a quick interview! How did you first become interested in plant science? When I started my degree in Natural Sciences (at Cambridge University), I was originally an animal person but then I was presented with a crab in a practical class which I had to put in boiling water! I never did…at that point I decided to focus on plants instead, but also because I really enjoyed the biochemistry of plant physiology. How did you get into plant genetics? My PhD was actually on the effect of Gibberellic Acid ( a plant hormone) on the germination of castor oil seeds…but I very quickly developed an allergy to them. I couldn’t even go into a room where they had been prepared. Towards the end, I went to a seminar by David Baulcombe on the effects of Gibberellic Acid on barley and wheat and he was doing genetics with mutants. I thought “That’s what’s missing from my research!” Plus this was not work on castor oil seeds! So I switched to genetics for my postdoc. How did your work on bio-fortified tomatoes begin? For a long time, I worked on Antirrhinum majus (Garden Snapdragon) because I was interested in the genetics of flower colour and transposable elements. Then I met a woman doctor in Italy who told me how important anthocyanins are in the diet, especially in the Mediterranean diet. I thought that this could be a different approach for me to understand biosynthesis of polyphenol compounds in plants, so I started to collaborate with her on the health benefits. We chose tomato because its relatively easy to transform, there are lots of mutant lines available and I quite like to eat them! What do you see for the future of bio-fortified foods? Will it spread to other crops? Johnathan Napier’s lab at Rothamsted research are already producing oilseed crops enriched in omega-3 Polyunsaturated Fatty Acids (see previous Blog post). But I think there will be a whole slew of fortified crops in the future – especially for countries that have less diversity of foods – including ones with high iron, zinc and pro-Vitamin A. Some will be produced using GM techniques and some by non-GM techniques, depending on what resources are available. There are alternative ways to obtain these high amounts of course – but I personally don’t see the future as being “eat all the junk food you like and take a pill at the end”. I rather prefer the idea that everyone improves their diets because it’s better for the long term. A particular problem for our next generation of adults is that they have been brought up on a lot of junk food and there has been such a decline of proper mealtimes and home cooking. What about those who feel strongly against GM technologies? People have many reasons for not choosing GM foods but I don’t think most people in this country even consider it. They would think about price and quality, and whether it is GM or not wouldn’t be a deciding factor. A friend of mine even complained when Sainsbury’s pulled the GM Flavr Savr tomato off the shelves because she was losing choice. People are quick to complain about choice, but we don’t have a choice at the moment. So long as it’s clearly labelled and safe, people should at least be able to choose. What do you like doing when you’re not in the lab? I love code words and Sudoku, and also walking in Majorca because of the fantastic scenery there. Also looking after our nine cats – my husband said we won’t bother neutering the females because we’ll make sure they don’t get out…that was a mistake! Finally, any advice for aspiring plant scientists? Plant science is fantastic because your material is always accessible – they don’t run away! But it is also really interesting as plants are simply not the same as animals. People don’t realise that you can do an awful lot on plants – especially molecular analysis and imaging – and it’s much less competitive than other fields, such as medicine. And, at the end of the day, you can eat them!